If you’ve ever had a glass of Macallan, chances are you know it’s good scotch. I’ve been fortunate enough to try their 12 Year and 18 Year varieties over the years, and when put on the spot for my favorite single malt, the Macallan 18 is one of only two possible answers I’ll give (the other being the peaty Laphroaig 15). Both the 12 and 18 Year are aged in sherry casks from Jerez, Spain—as was all Macallan scotch up until 2004. It was then that Macallan added “Fine Oak” as a new regular production range, aged in a combination of Jerez sherry casks, American sherry casks, and American bourbon casks. The Fine Oak 17, as the name suggests, is aged a minimum of 17 years. It’s the fourth-oldest scotch in the Fine Oak range, which also has 10, 12, 15, 18, 21, 25, and 30-year-old varieties. The nose on the Fine Oak 17 is very clean and vibrant with marshmallow, mango, and apricot. It’s a golden amber in color. On the palate the whisky reveals a smooth flavor, with muted oak, toffee, a touch of spice, and subtle wine notes that remind me of aged burgundy. The clean finish has a hint of dried fruit and substantial sherry notes. There’s no denying that this is a fine single malt scotch; it’s clean, bright, and complex. And although I still prefer the sherry cask Macallan 18, it’s no surprise that the Fine Oak 17 sells for $130. Like so many fine scotches, the Fine Oak 17 is the perfect accompaniment to a good cigar. I smoked a Padrón Serie 1926 Maduro No. 6 (pictured) and found that the noble medium- to full-bodied smoke brought out the complexity of the single malt. I wouldn’t want anything stronger though, as too much spice or body in the cigar would overpower the subtleties of the scotch. Keep that in mind and you’d be hard pressed to find a better after-dinner scotch to enjoy with good company and a fine cigar. Agree completely with this review. 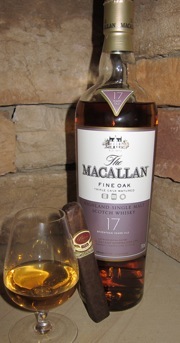 The Macallan 17 fine oak is very good, but the regular line 18 is fantastic.